Whitney Osuigwe's WTA ranking was up to a career-high of 309 this week after reaching the second round of the $80,000 USTA Pro Circuit tournament in Macon last week. The 16-year-old from Bradenton Florida, who started the year outside the WTA Top 1000 (but as the ITF World Junior No. 1), has made steady progress since leaving junior tennis after winning the USTA 18s National Championships in August, but today she had a breakthrough, getting her first WTA Top 100 win by saving a match point in a 6-4, 2-6, 7-6(3) victory over top seed and WTA No. 39 Belinda Bencic of Switzerland at the $80,000 tournament in Tyler Texas. Osuigwe had already shown her resilience earlier this week, coming from a set down against both Karumi Nara of Japan and, in Friday's quarterfinals, against good friend Caty McNally. She trailed Bencic 5-3 in the third set, but broke Bencic serving for the match at 5-4, only to get broken in the next game to give the 21-year-old former WTA Top 10 player another chance to serve for the match. Unlike at 5-4, Bencic did get to match point at 6-5, 40-30, but she hit a backhand wide. Two more Bencic errors and a tiebreaker would decide the match. It was 3-3 at the first change of ends, but Bencic made a regrettable error on an easy sitter at the net, then missed a backhand wide and netted a forehand pass to give Osuigwe three match points. Osuigwe only needed the first, with her backhand forcing a Bencic error to put her in the second Pro Circuit final of her career. After losing to Bencic in three sets in the WTA New Haven qualifying back in August, Osuigwe was not going to be intimidated today, and she now is getting to the area in the WTA rankings where she can think about Australian Open qualifying. She is also eligible for the USTA's Australian Open reciprocal wild card and will tie Varvara Lepchenko for the lead in the race if she wins Sunday against unseeded Beatriz Haddad Maia of Brazil, who beat Danielle Lao(USC) 6-2 6-3 today. 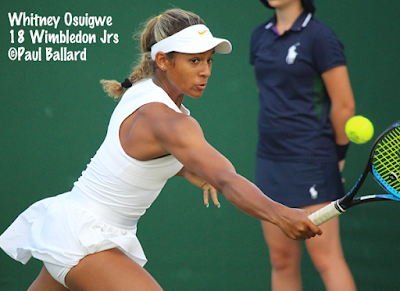 Because of her age, Osuigwe has to be careful about running up against the WTA age restrictions, which limit her to a total of 12 pro tournaments before her 17th birthday in April of 2019, although she has earned merited increases of at least three more tournaments due to her performance on the ITF Junior Circuit. Nicole Gibbs and Asia Muhammad won the doubles title in Tyler, with the No. 4 seeds beating top seeds Desirae Krawczyk(Arizona State) and Mexico's Giuliana Olmos(USC) 3-6, 6-3, 14-12 in today's final. In addition to Osuigwe, three other Americans will play for titles Sunday in North America. At the $75,000 ATP Challenger in Charlottesville Virginia, lucky loser Tommy Paul, who lost to Wake Forest senior and 2018 NCAA singles champion Petros Chrysochos of Cyprus in the final round of qualifying, continued to take advantage of his second chance. The 21-year-old American defeated top seed Bradley Klahn 6-3, 6-3, Paul's fourth consecutive straight-sets win. He will play No. 8 seed Peter Polansky of Canada, who beat wild card Thai Kwiatkowski(Virginia) 6-2, 7-6(4). At the $15,000 Futures in Birmingham Alabama, former Northwestern star Strong Kirchheimer will play for his first Pro Circuit title after the No. 2 seed defeated No. 6 seed Justin Butsch(LSU) 6-4, 6-3. Kirchheimer will face No. 5 seed Ricardo Rodriguez-Pace of Venezuela, who beat University of Tennessee senior Timo Stodder of Germany 6-4 6-4. Kirchheimer won his previous meeting with Rodriguez-Pace in three sets back in January. Stodder did get the first Pro Circuit title of his career however in doubles. Stodder and teammate Preston Touliatos, who received a wild card entry into the event, beat No. 4 seeds Korey Lovett(UCF) and Robert Kelly(UNC) 6-4, 6-3 in the final, their fourth consecutive straight-sets victory. And a second American 16-year-old, Charlotte Chavatipon, will play for her first title Sunday at the $15,000 ITF Women's Pro Circuit event in Mexico City. Chavatipon defeated No. 3 seed Melissa Morales of Guatemala 4-6, 6-3, 6-1 to reach the final, where she'll face University of Kansas senior Anastasia Rychagova of Russia. Rychagova, a qualifier, defeated No. 4 seed Alice Garcia of Brazil 3-6, 6-2, 6-3 in today's semifinal. Rychagova, who will seek her first Pro Circuit singles title Sunday, won her first career title today in doubles, partnering with Baylor junior Jessica Hinojosa Gomez of Mexico. The wild cards defeated Maria Carvajal Altamirano of Mexico and Raphaelle Lacasse of Canada 6-1, 6-4 in the championship match.